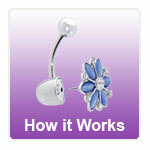 Screwbidoo is a Belly Bar, in which you can plug any of the silver "screws" that we offer for sale on this site. You can change your jewellery every day without the hassle of taking the whole barbell out of your belly button, and because the bar is Titanium, it is the safest metal for your navel piercing. Does Screwbidoo hold the screws well? Yes! It is tight enough so you will not lose the screw and yet not too tight so it can easily be changed without removing the banana bar from your piercing. Can you see that I am wearing a Screwbidoo? Can you buy Screwbidoo in different lengths? Yes! Screwbidoo is available from 6mm to 14mm. Do I have to take the Screwbidoo out if I want to change the screw? No! Screwbidoo can stay in your belly. To change the screw, hold the screwbi with one hand and squeeze your fingers near the setting, remove the setting with the other hand, then simply push in your new screw. Can I take the Screwbidoo out of my belly if I want to? Yes! Screwbidoo is just like any other normal barbell with a screw-on top ball. Can I take the top ball from my other belly bars and put it onto Screwbidoo? Yes! You can take any top ball from any other standard sized belly jewellery and screw it on your Screwbidoo. Can I get different coloured jewelled top balls for my Screwbidoo? Yes! You can match the colour of the top ball to the screw in your Screwbidoo. Simply screw the top ball off and screw another one back on. "Brilliant! Really good quality products will defiantly buying from here again!" "Great value for money and good quality jewelry"
"This is my second time buying jewellery from here and am yet again really impressed. The colours are fantastic, the sizes are accurate and the..."
"A simple purchase. Easy to navigate website. Good price."